Everything worked for me, except I can't access the radio (it has the wrong rig number when I try to change frequency) and I get the error "Config parameter error: Invalid parameter" when I exit. Can you tell me where the config. file is please? I get the error "Config parameter error: Invalid parameter" when I exit. Also, CAT isn't working because WSPR is using the wrong number fot the radio. Do you know where the config file is so I can edit it please? 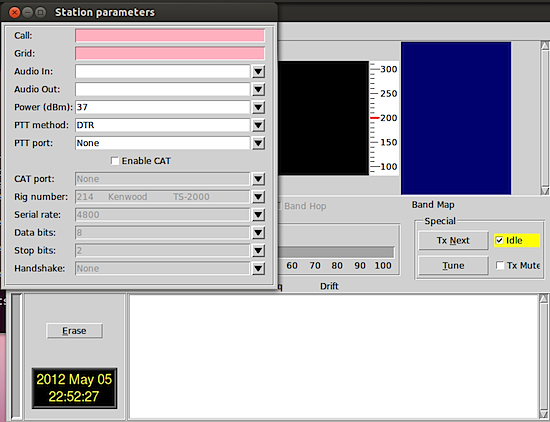 wspr stores its settings in a file called WSPR.INI in the same directory as the executable. Thanks for the great HowTo. Just compiled it on xubuntu 12.10 x64. I'm trying on a Banana Pi running Raspbian on SATA disk.